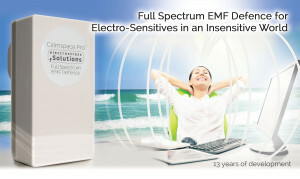 The main body of scientific evidence regarding EMFs/EMR refers to a-symptomatic long-term biological harm: effects at cellular level and on the body’s own defences and functions. However there is also an emerging condition known as electrosensitivity (ES) or electromagnetic hypersensitivity (EHS), where sufferers experience symptoms directly following exposure to electromagnetic fields/radiation. Common symptoms include head/ear pain when using a mobile phone, headaches, sleep disruption, heart palpitations, chronic tiredness, depression, skin tingling/crawling/burning sensation, rashes and skin irritation, dizziness, concentration and memory problems. Symptoms are often delayed and/or lasting beyond the period of exposure, a key factor not taken into account in many studies refuting its existence.